DUMBARTON had the better of the first half in their latest game at the Bet Butler Stadium, but after the break bottom of the table Livingston dominated to gain their first win of the season. On a very dull day the 794-strong crowd had their afternoon brightened by some good football and a close encounter, with Ian Murray's men a shade unlucky not to share the points. 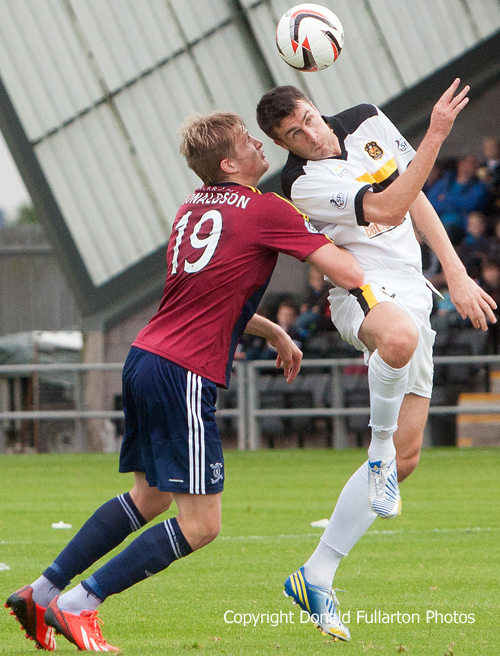 The visitors were hoping to impress new manager John McGlynn, but it was Dumbarton who had the best of the opening half. However it seemed they would never find the net. With just a minute to half-time they took the lead with a brilliant goal. Chris Turner crossed, Colin Nish sent a cushioned header into the path of Mitch Megginson, and he beat the keeper with a low volley. The home fans wanted more of the same after the break, but it was not to be. A reshuffled Livi midfield took charge of the game and set up striker Mark McNulty for two excellent goals. Sons through everything into attack in the final few minutes, but the visiting defence held out. The picture shows Colin Nish winning an aerial joust.